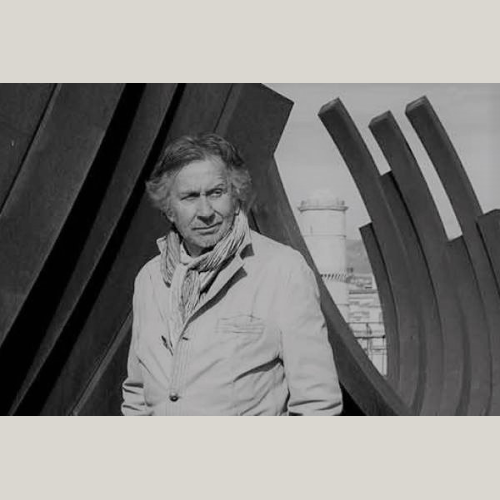 Bernar Venet (1941-) is a French conceptual artist, borned in 1941 in Château-Arnoux-Saint-Auban in the Alpes-de-Haute-Provence, the painter and sculptor studied at Villa Thiole in Nice in 1958 for a year before to continue his career as an artist. He has lived in the United States since 1966, where he became known for his steel sculptures and drawings. In the 60s, he shows paintings covered with tar. His notoriety began during this period with the realization of a sculpture without specific form consisting of a pile of coal poured on the ground. His faculty of intellectual abstraction and his taste for mathematical reasoning and experimentation lead him to what will soon be conceptual art. A friend with Arman, Jean Tinguely, Donald Judd and Sol LeWitt, Venet worked in minimalist and conceptual modes during the 1960s and 1970s. In the 1980s, he set up the basic structure of his Undetermined lines. He made them out of steel and installed them in many urban spaces and public collections, notably in Nice, Paris, Berlin, Tokyo, Strasbourg, Beijing, Austin, San Francisco, Museum of Grenoble. “My work is self-generating. Nothing around me particularly inspires me, “he explains about his abstract art. “I work and make discoveries while keeping an open mind about what might be a new opportunity in the context of my work; this framework seeks to expand its scope. ” He is made Knight of the Legion of Honor in 2005, creates the Foundation Venet in 2014, which serves as a museum and archives for his work. In 2011 the sculptor installs monumental works in the gardens of Versailles.